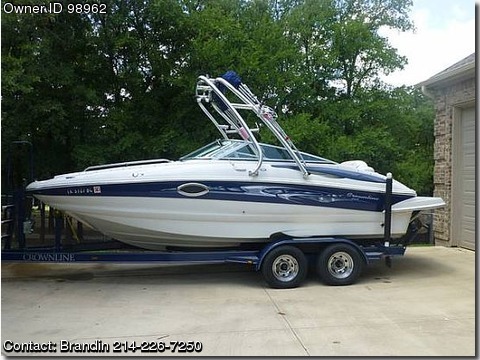 Boat is located in Keller,Texas.Please contact the owner @ 214-226-seven two five zero or brandindavis(at)gmail(dot)com…I am selling my 2006 Crownline 220EX Mercruiser 5.7 MPI for $32K. This is a very clean garage kept boat with only 152hrs on it. Listed below are what the value of the boat is worth and all the extras that are on it in the past 2years. $350 New carpet, still in box. $44,250.00 total Value and selling for $32,000.00.